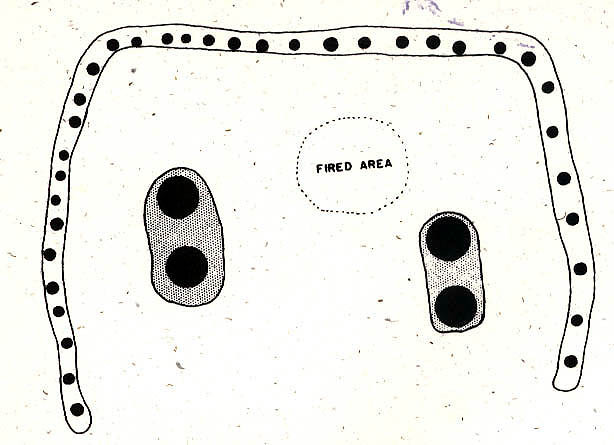 The River Bend Eastates (23SL78) and River Bend East Sites (23SL79) were excavated as a rescue project that began during Spring of 1959 as construction activity in Chesterfield, MO uncovered a series of low mounds and a village site. 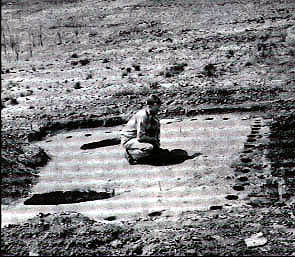 Archaeological work continued during 1960 and 1961. Dale Henning (University of Missouri - Columbia) excavating the post molds of a prehistoric structure number 2 at River Bend Estates. 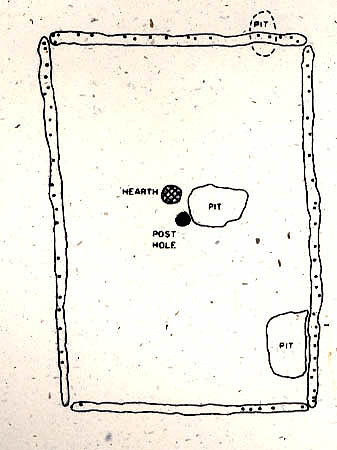 Henning's plan of Structure number 1 that included four large red oak support posts. This building was not for habitation, but ritual preparation of the dead for burial. 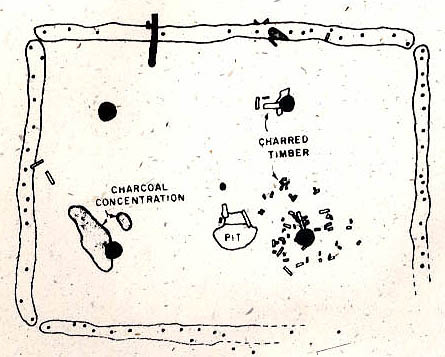 Hennings drawing of the crematory or charnel house structure at River Bend Estates. It measured 22 ft. long and 16 ft. wide. The floor was lined with limestone slabs, and four large support poles were situated in pairs within the structure. Bones from approximately 20 individuals were found clustered near the center of the structure. 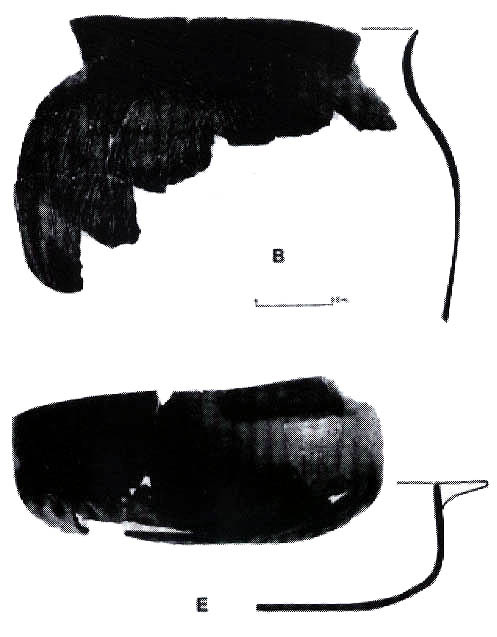 Hennings plan of rectangular house number 3 at River Bend East site was a habitation dwelling that measured 12 ft. by 16 ft.
Hennings drawing of house number 1 at River Bend East site. 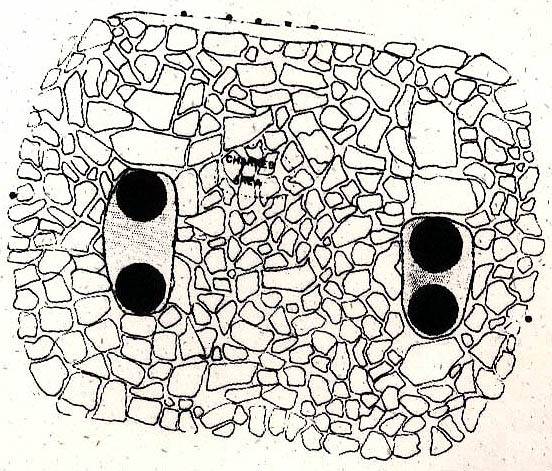 It is a wall trenched structure measuring 24 ft. by 18 ft.
Hennings drawing of grass mat impressions found in the dirt floor of house number 1 at River Bend East site. 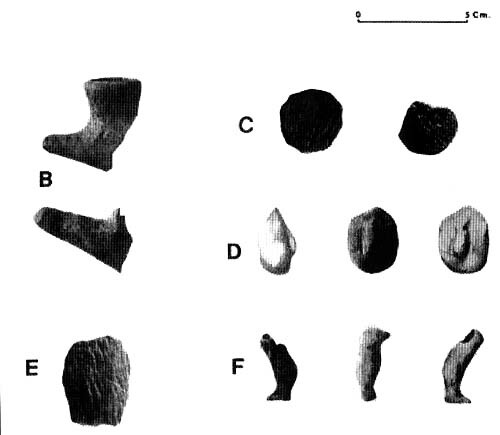 Ceramic pipes (b), disks (c), figurine faces (d), figurine legs (f) from River Bend East site. 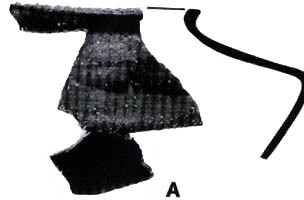 Dentate marked rim sherd from River Bend East site. 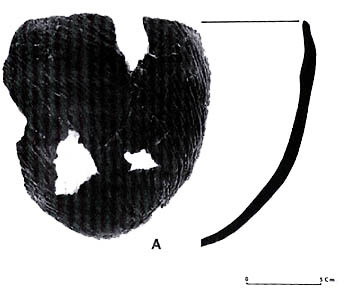 Cordmarked pottery vesesl from River Bend East site. 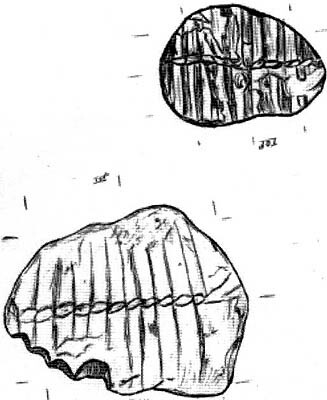 A cordmarked jar (b) and a burnished bowl with lip ledge handle (e) from River Bend East site. 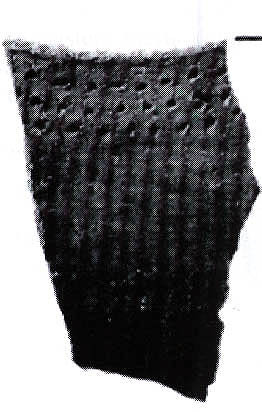 Carinated jar from River Bend East site. 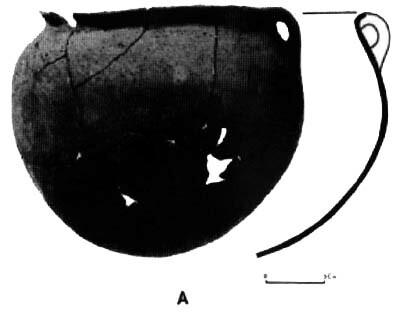 Cooking pot with strap handle from River Bend East site.